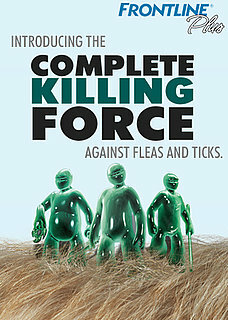 Fleas and ticks don’t stand a chance against the complete killing force of FRONTLINE® Plus. And, if you head to Fleas & Desist they won't stand a chance against you either. Fleas and Desist is a fun, interactive way to rid your virtual pet of fleas while having a bit of downtime from your day. So remember, unlike other products from your vet, only FRONTLINE Plus completely annihilates the flea life cycle on dogs and cats by killing fleas as adults, eggs, and larvae. Plus ticks. And, FRONTLINE Plus keeps killing for 30 days. Satisfaction guaranteed. That's why it's the #1 choice of vets for their pets* — and yours.† Get a coupon for a free dose at completekiller.com. *Data on file at Merial. ®FRONTLINE is a registered trademark of Merial.